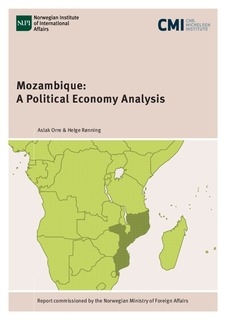 This report uses a political economy analysis to shed light on some of the paradoxes that characterize Mozambique mid 2017: Entrenched poverty, the resuscitated armed conflict/war, the trust crisis between the Mozambican (Frelimo) government and its development partners, the spiralling debt and the party-state. Since 2017, Mozambique is arguably at one of its most critical moments since the end of the civil war, in a crisis-like cocktail of political, economic and social problems. By the time of writing, the Mozambican authorities only released the content of the Kroll report (an independent forensic audit of the ‘secret’ loans taken up in 2013) in summary form. Mozambique defaulted on its foreign debt in 2016, which has become unsustainable for the immediate future. The ‘secret’ loans explain a smaller part of the new debt, while heavy international and domestic borrowing and public spending after the discovery of large new mineral resources drove up the debt levels. The economy unhinged not by a full-blown resource curse, but rather by the mere prospect of large future income from the offshore LNG gas and coal, which we dubbed the “presource curse”.